Now, click on this link to RTO Insider’s new post “DOJ Probing Interconnection Process in Exelon-Pepco Merger”. This story is about the US Justice Department’s anti-trust investigation of PJM. 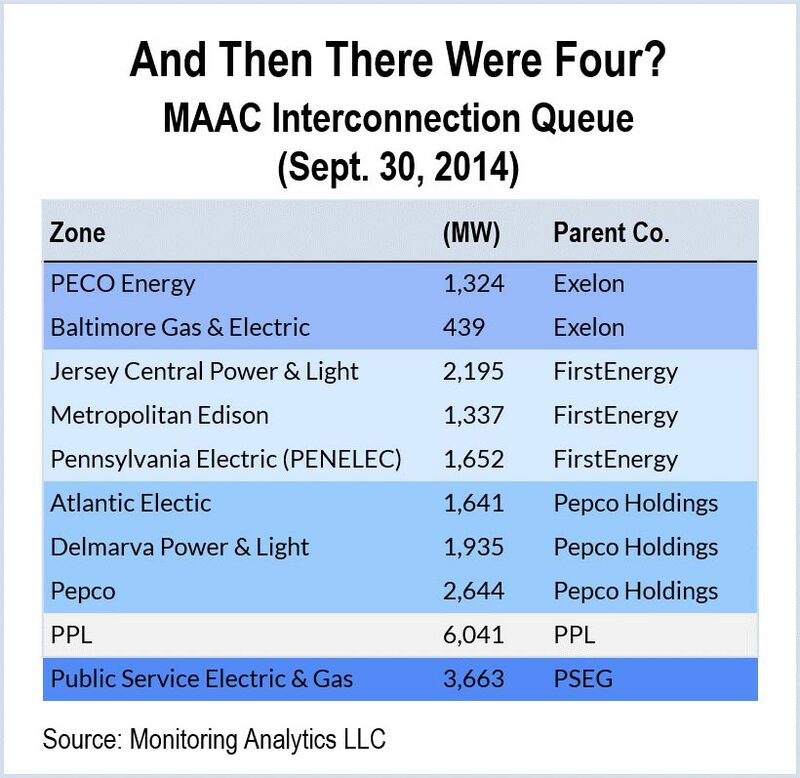 So we see that if the Exelon/Pepco merger goes through, the holding companies that control the big generators in the MAAC interconnection queue will fall from five to four. The Justice Department is investigating how holding companies in PJM’s MAAC sub-region (essentially the Mid-Atlantic states from NJ to MD) use their ownership of both transmission systems and generating plants to create difficulties for their competitors who are seeking to build new generation in the MAAC sub-region. Transmission owners control the requirements for interconnection with new plants. The big five (maybe soon to be big four) use this power to limit competition in the MAAC sub-region. Market Monitor Joe Bowring declined to comment yesterday on the department’s inquiry. But the Monitor has been recommending since 2013 that PJM outsource interconnection studies to an independent party to avoid potential conflicts of interest. “Currently, these studies are performed by incumbent transmission owners under PJM’s direction. This creates potential conflicts of interest, particularly when transmission owners are vertically integrated and the owner of transmission also owns generation,” the Monitor said in the third-quarter report. “There is also a potential conflict of interest when the transmission owner evaluates the interconnection requirements of new generation which is part of the same company,” the report added. Go back and look at that definition of “cartel.” Did you catch the phrase “designed to limit competition”? That’s what this is all about. I think it is hilarious that Joe Bowring refers to these practices as “potential” conflicts of interest. Potential? They have been going on for years, ever since PJM and other regional transmission organizations arose from the ashes of deregulation, with FERC’s blessing. Speaking of FERC, the Justice Department’s investigation began just five days after FERC announced that it approved the Exelon/Pepco merger. In other words, FERC said, “Nothing to see here, just keep moving.” The Justice Department apparently thought otherwise. The Justice Department investigation is a big deal, and could throw a real monkey wrench in Exelon’s attempt to swallow Pepco. This situation is the flip side of what happened in the PJM transmission line fiascos like PATH and TrAIL: PJM’s transmission planners colluded with big generators (AEP and FirstEnergy) to rig new transmission projects to serve those generators existing power plants. Cartels are truly wonderful things, if you are a member of one. Hats off to RTO Insider’s great coverage of more PJM fakery. PJM Interconnection has again gone after a tack with a pile driver, in the words of reliability expert George Loehr. In January 2014, PJM got caught short on capacity during a few cold snaps as coal piles froze and pipes burst at coal plants and natural gas providers broke contracts with gas power plants to sell on the higher profit heating markets. Instead of simply dealing with capacity issues during winter peak, PJM’s bureaucrats decided to do a complete overhaul of their entire capacity system. Remember that before the artificial “market” system created by deregulation, all capacity situations were handled by state PSCs which simply told the vertically integrated power companies within their jurisdictions how much reserve they needed and how much capacity investment they were allowed to pass on to their customers. States controlled the whole shebang because power companies couldn’t operate outside state boundaries, except in rare cases. Now that deregulation has ushered in the new era of energy speculation and artificial capacity markets, power companies use their positions in regional transmission organizations to jack up costs for their customers. Bureaucracy, jargon and obfuscation are the tools that power companies to hide what is going on in their RTO cartels. Whenever the PJM cartel wants to make a big change, it generates a smokescreen by inviting comments from “stakeholders.” In the latest capacity market overhaul, 14 stakeholder lobbyist coalitions have formed to push various modifications to PJM’s proposal. The coalitions give you a good picture of how the PJM cartel works. RTO Insider has a good summary of the coalitions and their positions. I won’t pick apart who stands where on all the issues. You can do that for yourself. I will say the positions are not surprising if you know anything about the backgrounds of the companies and organizations and agencies listed. You should note that state public service commissions, which once controlled the capacity process, are now only one part of what is described as the “Consumer Coalition.” That gives you a good picture of how federal legislation in the 1980s and 1990s wrecked the old system. The coalition said the proposal would impose $7.9 billion in additional costs to load for delivery years 2016/17 and 2017/18, providing a windfall to generators that cleared auctions for those years and already qualify as CP resources or have already taken steps to improve performance since the winter. The coalition also said implementing all of the proposed changes in time for the 2015 Base Residual Auction was too rushed. The group proposed spending $200 million to $600 million for winter-only improvements. In addition to these objections, other coalitions point out that PJM’s plans would also eliminate a lot of renewable power, energy efficiency and demand management resources from PJM’s capacity markets. Is this a coincidence? Of course not. The big nuke and coal generators that control PJM have finally found a crisis that they can use to their advantage to do what they have been trying to do for years. This pattern was largely repeated on January 24 and January 28, when more cold weather hit the PJM region. 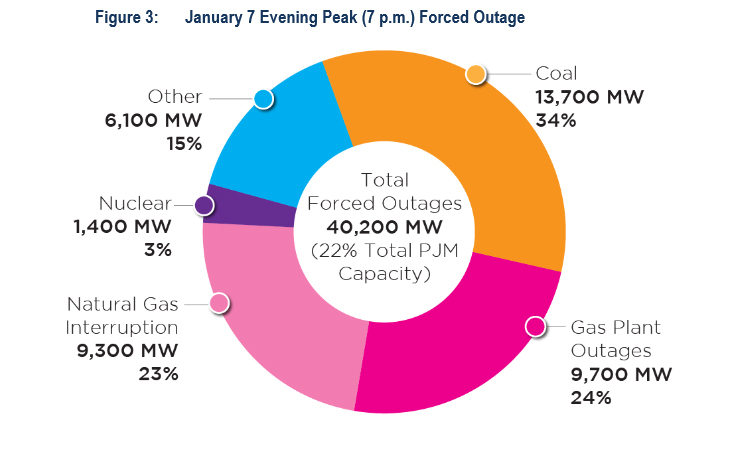 So the problem was with delivery of capacity by the coal and natural gas generators during a winter peak that PJM’s own report claims was a once in ten year occurrence. Yet PJM wants to overhaul everything and give more bonuses to coal-fired generators, who already demonstrated they couldn’t make the grade. Most directly, wind energy provided highly valuable electricity when PJM, the regional grid operator, needed it most. During the period of peak demand on Thursday evening [January 9], wind energy was providing PJM with 3,500 MW while electricity prices averaged more than $500 per MW hour (MWh), providing direct savings of $1.5 million to $2 million per hour. While natural gas generation suffered a major collapse during the crisis, wind generated electricity provided a vital substitute for a lot of that missing capacity. During these times of peak demand, wind energy was primarily displacing gas use at natural-gas fired power plants. Many areas in the eastern U.S. were at or near record natural gas prices due to weather-driven demand for natural gas for building heating as well as electricity generation. Because the natural gas price curve is also quite steep during times of peak demand, and because the market price applies to all transactions in the market, wind energy likely produced large savings for all natural gas users by driving down the price of natural gas. So even if you primarily use natural gas to heat your home (in addition to electricity to run your furnace fans) you can thank wind energy for helping to keep your heating bill low. It is clear from the actual events of January 2014 that if power companies in PJM had been investing in the last five years in offshore wind power, instead of frantically chasing lower gas prices with new gas-fired generation, most of PJM’s capacity problems could have been avoided. Instead providing real solutions for the real problems, the PJM cartel wants to pour more of our money into rigging PJM’s PIG rules to favor big generators that control the cartel. The American Public Power Association has published its latest biennial report on the impacts of mandatory capacity markets. This report is not a theoretical analysis. It looks at individual projects built in 2013 and how they were financed. Most of the 24 page report is appendices with tables describing the new generation plants built in 2013. As in their 2012 report, APPA concludes that, particularly in terms of stimulating new generation in areas where it is needed, capacity markets run by RTOs have almost no impact on creating new generation. As was found in the analysis of 2011 generation, almost all new capacity was constructed under a long-term contract or ownership. Just 2.4 percent of the new capacity was built for sale into a market, a number that includes new facilities for which no information could be found about the contracts. Moreover, when broken down geographically, only 6 percent of all capacity constructed in 2013 was built within the footprint of the RTOs with mandatory capacity markets. APPA thus found that all of the electric industry’s claims about capacity markets stimulating new investment are just wrong. Who are the members that control the RTOs? The big boys in an RTO are the holding companies that own a lot of existing generation capacity. They have designed the capacity markets not to help new competitors enter their markets. The incumbent generators design the markets to line their own pockets. Are the capacity markets the least-cost means to achieve reliability? Different resources have different costs. In these markets, a 50-year old coal plant is paid the same amount per MW and for the same duration as is a brand new highly efficient combined-cycle natural gas plant as is an agreement by a factory to curtail load when needed. As a result, excess windfall revenue is paid to the older depreciated plants and the revenue stream is not stable enough to attract investors in new resources. The bulk of revenue has been paid to existing plants. In the PJM Interconnection (primarily covering Maryland, New Jersey, Pennsylvania, Virginia, West Virginia, Ohio, northern Illinois, and Delaware), $72 billion has been paid or will be paid by consumers to generators and other capacity providers. Yet over 90 percent of this revenue has gone to existing generation, although many older plants have paid off much of their fixed costs. Moreover, most of the new generation capacity that has been built was done so under utility ownership and long-term contracts, not as a result of capacity market payments. Capacity markets do not ensure an appropriate mix of resource types. Because the capacity markets do not distinguish between technology types or specific locations on the grid, critical needs are not addressed, including adequate flexible ramping capability to match the variability of renewable resources, reliability gaps created by retiring coal plants, the coordination of natural gas infrastructure and delivery with the significant expansion of natural gas generation. As a result, the RTOs often create systems of side payments to ensure reliability, such as direct payments through what are known as reliability-must-run agreements to coal plants to remain in place to ensure reliability. Price signals are not effective. If transmission congestion limits the ability of capacity in one area to deliver lower cost power to another zone, the more congested zones may have a higher price. The theory behind zonal price differentials is that higher prices will act as a “signal” for the development of new generation or transmission. But such higher prices are not effective signals because owners of generation have no financial interest in building new resources and lowering prices for their existing units; investors seek steady and predictable revenue flows, not fluctuating prices; and many other factors influence the decision to build, including land and transmission availability, local acceptance, and environmental rules. Transmission construction may alleviate these price differentials, meaning that consumer paid both for higher prices and for the cost of the transmission. So APPA concludes that good old fashioned contracts between a seller and a buyer (bilateral contracts) and internal investment by power companies provide the long term financial stability that investors need to build power plants. Capacity markets can never provide that kind of stability and assurance of cash flow. All capacity markets do is provide a smokescreen for power companies to pick rate payer pockets, to the tune of $72 billion in PJM alone, according to the report. Of course, generation capacity is largely a problem because of peaks in demand in most US RTOs. The US electrical load is characterized by wide swings from normal base load to very short periods of very high load. There are winter peaks, caused mainly by heating, and summer peaks, caused mainly by cooling. But what if we tackled the capacity problem by tackling what causes it – the demand problem. What if we did what the Danes did, and eliminated electric heating almost entirely by using gas combustion and “waste” heat form power plants and manufacturing businesses? Then the winter peak goes away. Summer peak is a little different, because that is caused by cooling, which is tied pretty tightly to electricity by air conditioning technology. Winter peak could be eliminated entirely by shifting all electric heating systems to other heating sources. Heating with electricity is also phenomenally inefficient. Eliminating electric heat would eliminate the need for rate payers to pay for thousands of megawatts of generating capacity and transmission lines during times of even normal load. But in the US, there is no planning across industries. There is no attempt to reduce electrical use by shifting technologies from the electrical sector to the natural gas sector by expanding heating. Using natural gas or biomass combustion for direct heating is much more efficient than burning gas or biomass in a power plant, even a highly efficient one, sending that electricity hundreds of miles and running it through a resistance coil in a furnace. This lack of planning across sectors has also led to the absurd situation last winter in which large parts of the US were left with shortages of both electricity and natural gas for heating because so much electricity is now generated by natural gas power plants. So capacity markets aren’t even the best way of planning capacity for peak load. Here too, capacity markets are money for nothing. A recent story in industry journal SNL (subscription only) describes objections made by Joe Bowring, PJM Interconnection’s Market Monitor, to the Federal Energy Regulatory Commission about Exelon’s proposed purchase of PEPCO Holdings, Inc.
“The greater the proportion of the RTO’s assets represented by the transmission owner, the greater the threat of exit to the RTO and the greater the potential influence of the transmission owner over the RTO governance and processes,” Bowring said. Bowring’s objections all revolve around the point I have made many times on The Power Line – that PJM, and all other regional transmission organizations, is essentially a cartel designed to set prices and limit access to markets. Power companies supported the so-called deregulation of US electricity in the 1980s and 1990s not to promote “free markets” but to shed themselves of unprofitable business structures and state regulation. The growing number of mergers in the US electricity system today is focused on creating large, multi-state holding companies that once again control distribution, transmission and generation subsidiaries. These holding companies, like AEP, FirstEnergy and Exelon, can now play off one market against another to exercise market power and maximize their profits. Largely as a result of removing control of the bulk transmission system from state control, these holding companies used their leverage in the Cheney Administration to create a massive subsidy system based on radically expanded federal control of the planning and construction of high voltage transmission lines. It is not surprising that transmission is the new gold mine for power company profits. All of these subsidies are paid for by rate payers. As Bowring points out, it is the control of both transmission and generation that gives the new holding companies their real market power in PJM. PJM controls what new power plants are allowed to “interconnect” with the regional transmission system. The RTO determines who wins and who loses, because without interconnection, a plant can’t sell its electricity. And who controls PJM? Its big holding company members who also own lots of obsolete and expensive generation. Exelon has a particular problem. It is one of the largest owners of nuclear power plants in the US. It is even more difficult for nuclear power plants to ramp production up and down than it is for coal-fired plants. Essentially, the nuclear dinosaurs must run all the time. That means that they have to take whatever prices are available on the wholesale markets. Increasingly, particularly with the growth of renewable power, which has zero fuel costs, there are times of day, particularly when wind farms are putting a lot of energy into the grid, when Exelon’s nuclear plants have to operate at a loss, because their operating costs are higher than the prices available to them in the market. Stagnant demand, the growth of demand resources and the expansion of competition from solar, wind and more flexible natural gas plants force Exelon’s nuke plants to take major hits to their bottom lines. PJM is on the verge of making big interconnection decisions for offshore wind farms. If Exelon is allowed to merge with PHI and become a giant at the PJM cartel table, how enthusiastic do you think Exelon/PHI will be about letting large new offshore wind farms into its cozy PJM market? Neither Exelon nor PEPCO Holdings controls any electric companies in WV, but their merger’s impact would raise WV rates through PJM’s cost recovery mechanisms. Federal court cases drag on forever. Remember the 7th Circuit Appeals Court decision in 2009 throwing out PJM’s FERC-approved recovery of costs from all PJM rate payers for transmission lines that benefit only eastern PJM customers? In that decision, the 7th Circuit remanded the case to FERC, ordering FERC and PJM to fix their cost recovery scheme so that only people who benefit from transmission lines like PATH would pay for them. In response, FERC held a “paper hearing” to respond to the 7th Circuit. In March 2013, FERC issued an order which the Commission claimed responded to the 7th Circuit’s concerns. Except it didn’t. It was the same old recycled crap in a new wrapper. To summarize, the lines at issue in this case are part of a regional grid that includes the western utilities. 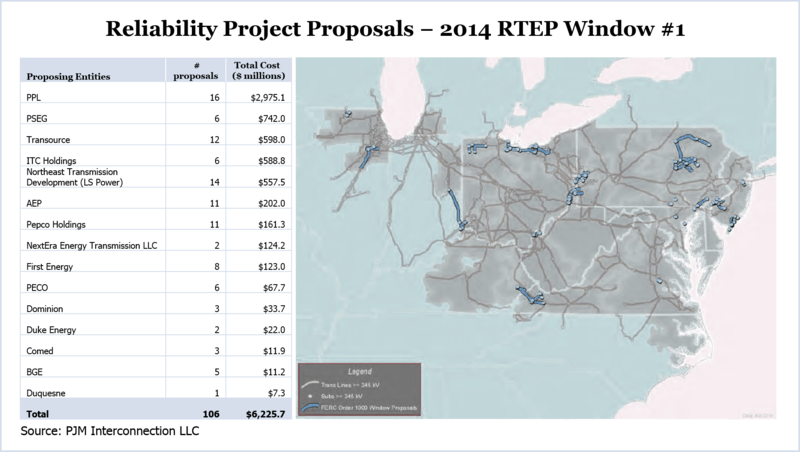 But the lines at issue are all located in PJM’s eastern region, primarily benefit that region, and should not be allowed to shift a grossly disproportionate share of their costs to western utilities on which the eastern projects will confer only future, speculative, and limited benefits. The petitions for review (from the original plaintiffs) are granted and the matter onceagain remanded to the Commission (FERC) for new proceedings. Judge Posner agrees with those of us who opposed PATH because we would be paying with our electric rates and our land for a line that only benefited people to the east of us. FERC and PJM are playing games with the 7th Circuit court. The Commission and the RTO need to pull up their big boy pants and get cost recovery right. This 7th Circuit case only applies to PJM’s pre-2013 transmission projects, like the ones it pushed in Project Mountaineer. PJM has already abandoned its past practice of forcing every rate payer in its system to pay for high voltage transmission lines. In 2013, PJM adopted, and FERC approved, a system that is a hybrid of the old (still wrong) “postage stamp” system and a formula that requires costs to be born only by those who benefit from a project. This new system is not what it needs to be, but it is much more realistic than the old boondoggle system that the 7th Circuit has now rejected twice. If PJM cannot please the 7th Circuit, will the court require PJM and the transmission companies like PPL and PSEG (Susquehanna-Roseland) and FirstEnergy (TrAIL) to disgorge all their ill-gotten gains in rate payer refunds? We’ll see.